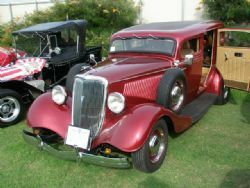 The last weekend in February offers classic car enthusiasts across Australia a smorgasbord of local events. I was lucky enough to have the American Car Sunday event just down the road at Pittwater Rugby Park in Warriewood so I rounded up the family and we headed down early to check out what was on offer. This event is pitched at all owners of American cars and I believe it has the right business model for a successful day. Entry for exhibitors is free and to encourage you to get in early they provide a free breakfast from 7-8am. Spectators pay an entrance fee of $8 per adult, $5 concession and $15 for a family. There are the usual vendors, food and the like and a free jumping castle for the kids so everyone is catered for. A lot of car enthusiasts are not very happy about having to pay to show their car while the punters get in free. By reversing what normally happens this event attracts a lot of locals from the northern beaches, quite a few car clubs and the money raised this year went to the Westmead Children’s Hospital. 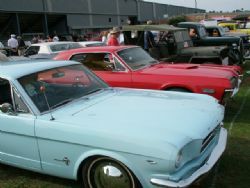 The spectrum of cars covered the lot – Ford was well represented by various rods, Mustangs, Thunderbirds and Customlines. Plenty of Chevy’s were on hand including Camaro, Corvette, Tri Fives, rods, Impala's and a smattering of other GM brands. 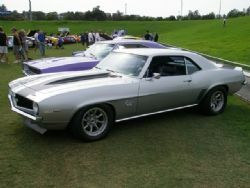 A silver 69 Camaro (pictured) got my vote but my five year old daughter was well over it by lunchtime so I don’t know who took out the three People’s Choice Awards on offer. Plenty of great looking hot rods were present and the Northern Beaches Hot Rod Club had a good showing of members’ cars and the classic caravan attached to an early 50’s Ford drew a big crowd of inquisitive lookers. 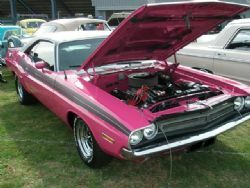 The Mopar’s in plum crazy, candy apple red and other distinctive seventies colours stood out in the field and you could spot everything from the small blocks through the imposing 440’s. There were AMC Javelins, Studebakers, vintage and veteran marques, a big array of Cadillac’s, or should that be an array of big Cadillac’s.... Every time I walk around a Caddy it still amazes me that people have garages that these cars fit in. Project home builders certainly do not cater for Cadillac enthusiasts! I had a chance to get around and talk to a few people due to the presence of the kids jumping castle and everyone there had a smile on their face and were enjoying themselves. Over by the grandstands was a guy from Argentina in a very old (I think circa 1926) vintage jalopy that he was driving around the world with his pregnant wife and three kids. He had driven to Alaska, was currently doing Asia and had documented part of his trip in a book. I attempted on three occasions to have a chat with him but the crowd was too deep and I couldn’t even get a photo of his car for the sheer mass of bodies in the way. As always a good day, great crowd and plenty of pristine American classics to check out. It was also great to see a lot of unrestored roughies present that obviously had chalked up plenty of miles and are still being enjoyed by their owners. If you are in Sydney this is an annual event and one that is well worth checking out in the future.